I saw this on the wrist of the host of one of the tastings I do as a matter of course for my food blog. What an unusual piece. 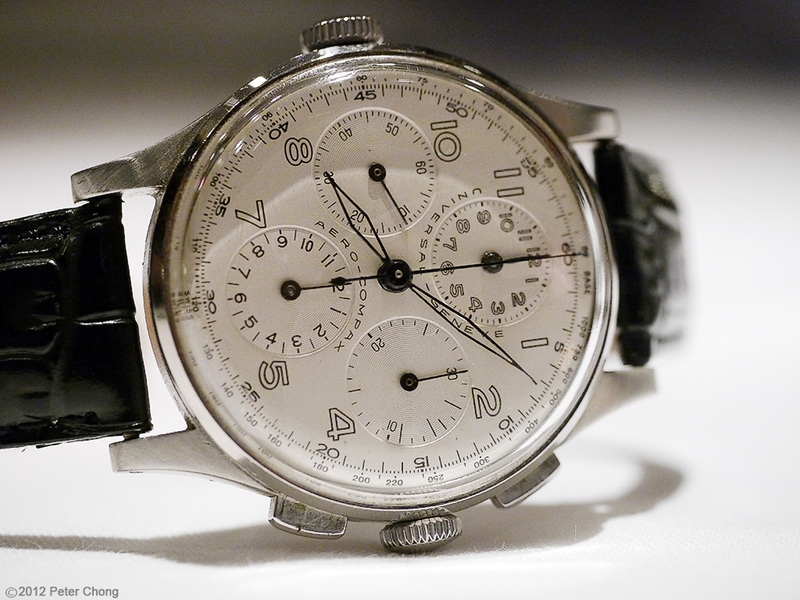 A vintage, Universal Geneve Aero-Compax. Even more amazing is the story on how he acquited it. He was on a business trip to Paris, and spied on the corner of a shop window this magnificent watch. He looked at it, and went back to his hotel...but could not stop thinking about the watch. He was not a collector, just the typical male who get excited at times, by mechanical stuff. He returned to the store the next day and got a bargain price for this wonderful time piece. Apologies for the poor lighting...this was taken in situ in a steakhouse...with typical steakhouse lighting. But I had to show the watch as it is a rare find these days, especially one in such a good condition.